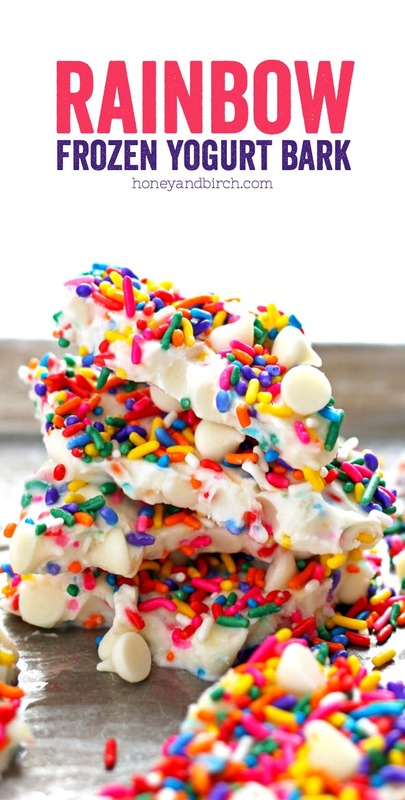 Rainbow Frozen Yogurt Bark is so easy to make that it is the perfect quick snack or dessert. 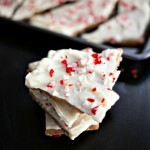 I have two frozen yogurt bark recipes on my site, Honey and Birch, and they are two of my most popular recipes. 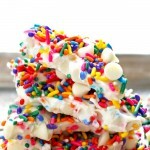 Frozen yogurt bark is so easy to make that it is the perfect quick snack or dessert. You could even eat it for breakfast if you really wanted to – I bet its a tad healthier than some of those super sugary cereals. It is very easy to make up a batch – you stir non-fat Greek yogurt and honey together and then fold in your flavor enhancers. 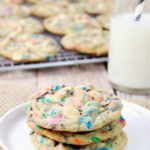 In today’s recipe, that means white chocolate chips and rainbow sprinkles. 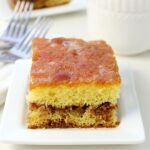 Pour the whole mixture on top of a sheet pan that has a silicone cookie sheet liner, foil, wax paper or parchment paper lining it. Then add another layer of your additives. 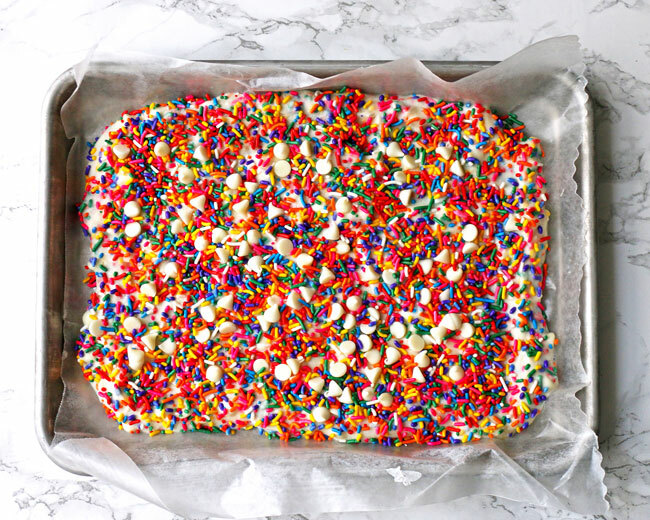 When making this rainbow frozen yogurt bark, that was definitely my favorite part. 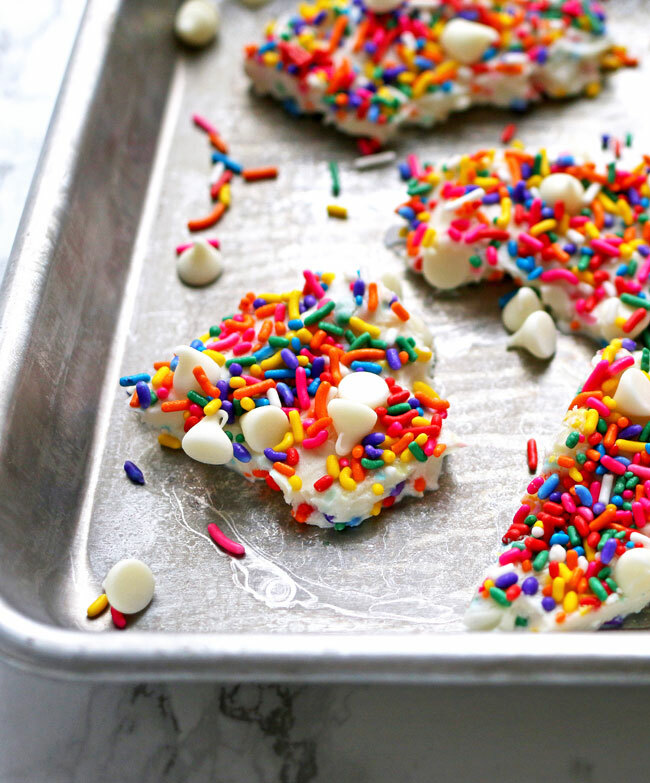 I sprinkled the remaining white chocolate chips evenly across the top and then covered all of the open spots with sprinkles. It was kind of like decorating cookies or a cake but for some reason, a whole lot more fun. I like to think that’s because I will feel less guilty when I come back for seconds. Place your sheet pan in the freezer and let it set for at least two hours. Bam. 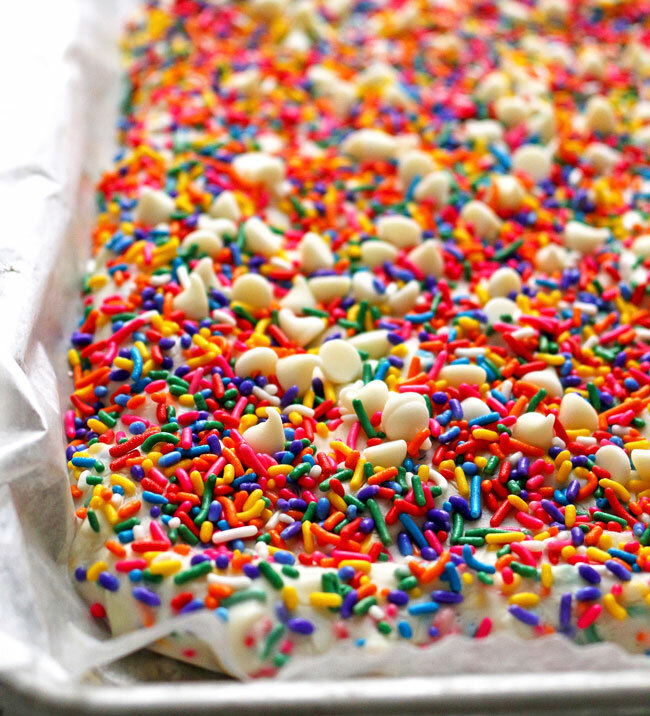 Rainbow frozen yogurt bark. A couple eating tips: it’s frozen, which means it’s going to melt. 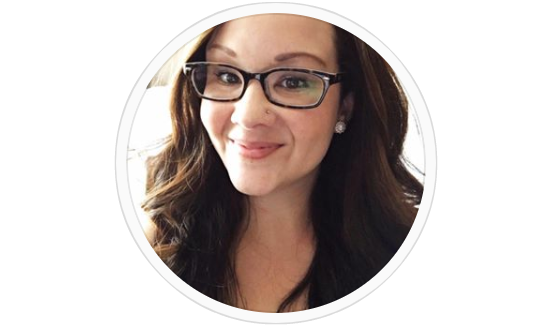 If you are giving it to your kids, grab a piece of parchment paper and wrap it around the pieces as you hand them out. 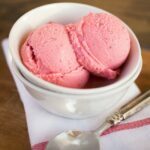 Another option is serving it in a bowl, like ice cream. Or you could go my route: messy hands and mouths with some soap and water nearby. We like to break up each batch right after it sets and then place the pieces in freezer bags. 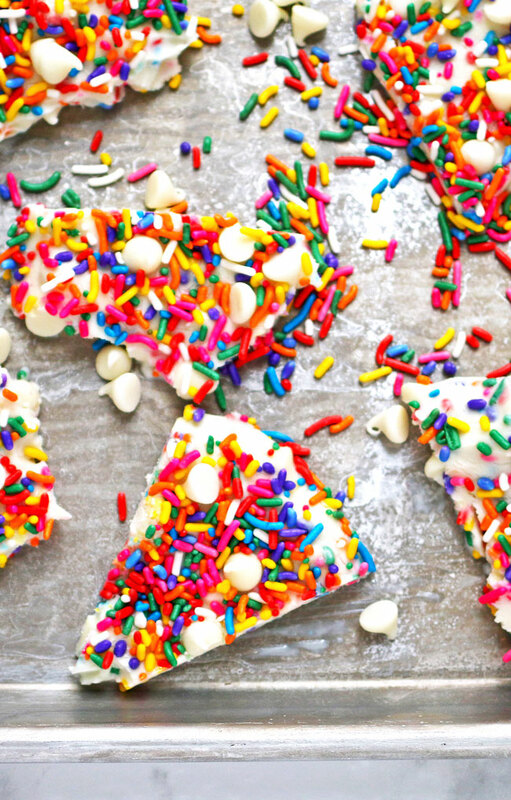 Then whenever we get a craving, rainbow frozen yogurt bark is waiting for us. Line a 1/4 sheet baking pan with parchment paper or a silicone baking mat. Pour the yogurt mixture over the cookie sheet, smoothing with your spatula until the layer is even. Evenly distribute the remaining white chocolate chips and the sprinkles over the top of the yogurt mixture. Put the baking sheet in the freezer and chill for at least 2 hours. Break into large pieces to serve. Serve cold and keep in the freezer or on ice. 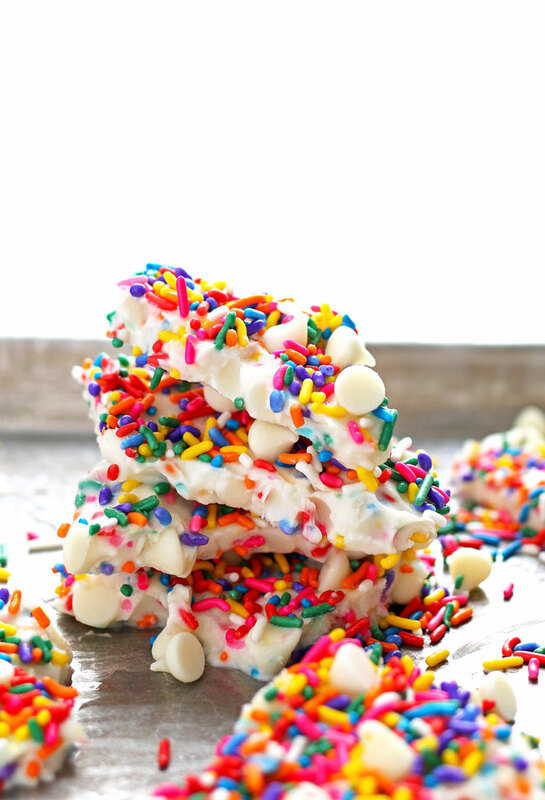 Looking for more frozen yogurt bark recipes?